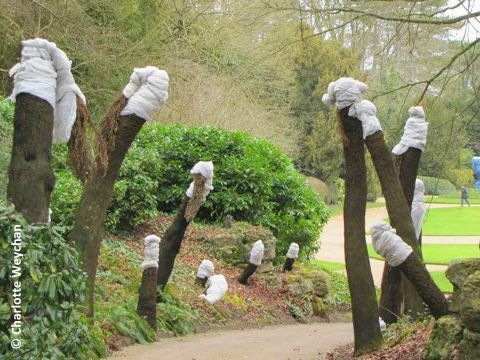 Waddesdon's winter mantle! One to revisit in April! 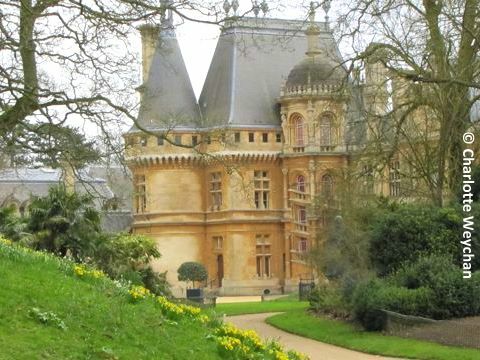 In my search for first signs of spring this week, I came across Waddesdon Manor in Buckinghamshire - an amazing 19th century house, designed by a French architect for Baron Ferdinand de Rothschild. 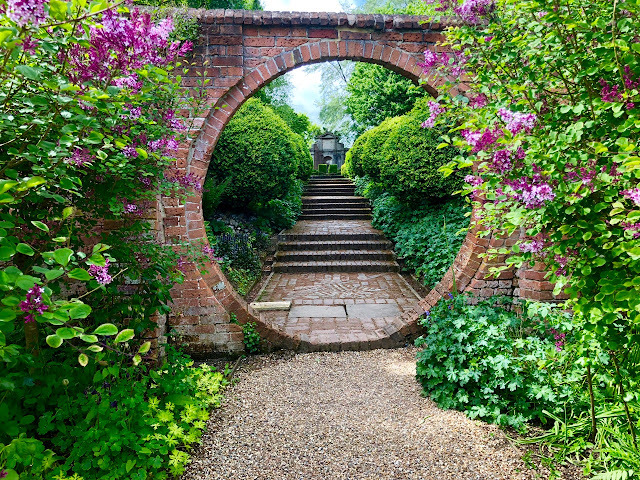 This is an extraordinary French chateau-style edifice, in the heart of England, overlooking some 160 acres of grounds and promising to be quite spectacular when the parterre (below) comes into bloom in the next few weeks. Both house and grounds are under the stewardship of the National Trust, and the gardens remain open at weekends throughout the winter months. I cannot imagine how many bulbs are planted to make the parterre bloom, but seeing the first signs of spring here has made me determined to see for myself when I return from the US. This is a garden on a truly grand scale and one to be featured with many great other landscape gardens in the area, including Ascott (another former Rothschild residence), Cliveden, Stowe Landscape Gardens and West Wycombe Park, But right now, Waddesdon - like so many other English gardens - is still shaking off the vestiges of an unusually brutal winter and staggering back into spring. 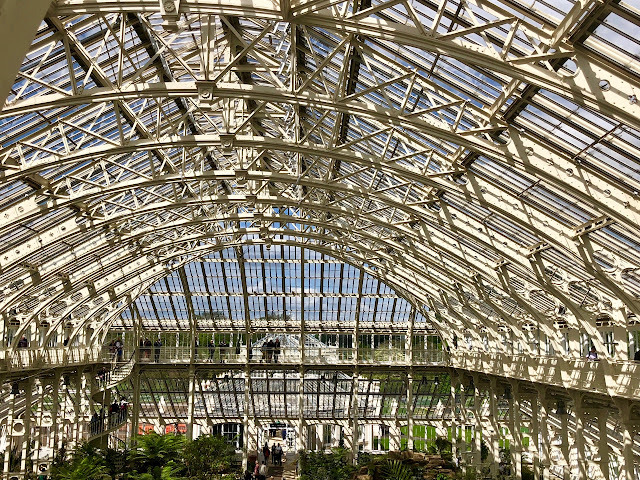 To the west of the parterre, there is an extraordinary Rococo aviary (above), erected in 1889 to house Ferdinand's collection of rare and exotic birds. 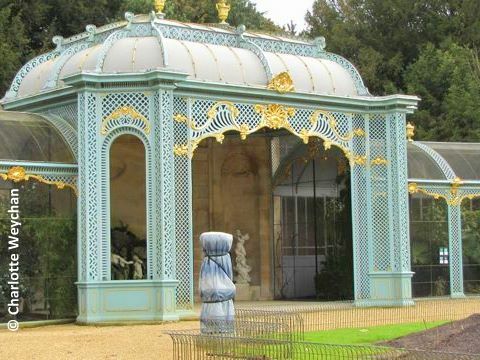 This too, formed part of the pleasure gardens that made a visit to Waddesdon so memorable under the Baron's stewardship. It was fully restored some seven years ago and continues to make Waddesdon visits memorable, although when I visited at the weekend, the birds were far back in their cages, huddling up against the bitter cold! At this time of year, you have to leave the promise of spring and summer flower displays to your imagination, and enjoy the wonderful walks through the estate, safe in the knowledge that there will be abundant flower life here in the near future. 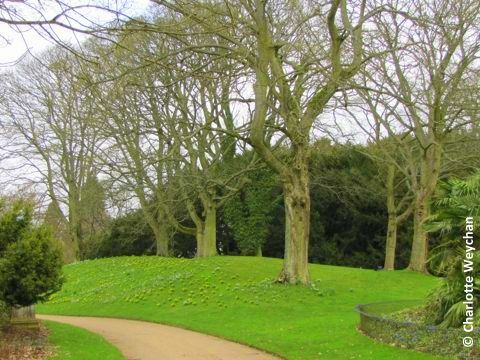 The main gardens were designed for Baron Ferninand by French designer, Elie Laine, but he continued to take an active part in their upkeep during his lifetime. Successive generations of Rothschilds who subsequently resided at the Manor after his death, also remained involved in the garden. Even the tree ferns are still sleeping (above); wrapped to protect them against the continuing morning frosts. As I left Oxfordshire en route to Brighton, my thermometer showed minus 4 centigrade, so I'm not surprised the plants need protecting! But this is one to watch and I promise to return to see the parterre in bloom. Waddesdon holds its annual Tulip Festival in April, and I'm sure this will be worth making a special visit to see, especially given its proximity to Chenies Manor, which is on my Wish List for 2011! 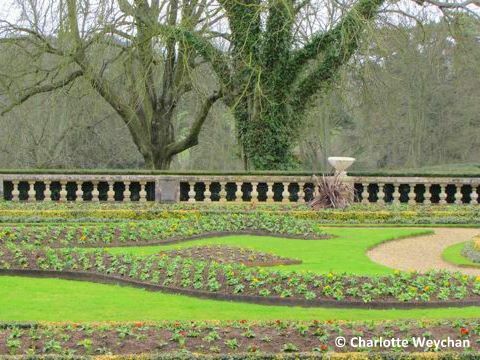 Nice to see mention of French landscape designer Elie Laine (or Hélie Lainé, I've seen it spelt all sort of ways), who is little known today, but who was instrumental in restoring the glorious Le Nôtre gardens at Vaux-le-Vicomte, just southeast of Paris, as well as creating the parterres at Waddesdon. Now I must go and find out what a tree fern is. So much to learn in these garden blogs. Still, even though it's cold there, you can take heart in knowing it's much colder here, especially at nights...but a mild spell for two days did HUGE damage to the snow. We'll make it through, all of us. The sight of all those daffodils was a real spirit-lifter. I have no idea what a tree fern is but they look like they're wearing turbans in the last picture! I love the new photo at the very top. It looks like the beautiful live oaks of South Carolina. This place looks incredible, and I'm with the above poster, I've never seen a tree fern myself.. at first I thought some mass tree murdering maniac had come by and chopped off their heads... :) must google this. I think on my next trip to the UK I'm going to print out your blog and go see some of these places you never hear of. Thanks for sharing those pictures with us. They make me feel nostalgic about England.